"The Need for Multidisciplinary Cooperation in Child and Family Justice in Hong Kong"
in Anne Scully-Hill, Sala Sihombing and Katherine Lynch (eds), Reforming Hong Kong's Child & Family Justice System (CUHK Press, 2016) ch 10. Introduction: Hong Kong is facing significant pressure for meaningful reform of its child and family justice system to ensure that it serves the needs of Hong Kong children and families. The recent death of five-year old Yeung Chi-wai at home by ingestion of lethal amounts of crystal methamphetamine drugs (despite an earlier decision to remove him from his home) is but one tragic example of the deficiencies in Hong Kong’s child and family justice system. Speakers at a recent May 2016 meeting in Legislative Council highlighted the flaws in Hong Kong’s existing child protection system, including: outdated child protection laws, no legal duty to investigate cases of abuse or assess victims and make required provisions, lack of accountability and enforceability of the multidisciplinary case conference mechanism, lack of adequate social work resources and chronic shortages in residential homes and foster case for children in need. The sad death of Yeung Chi-wai emphasizes the pressing need for multidisciplinary collaboration and reform of Hong Kong’s child and family justice system and the introduction of new legislation that adequately protects children. Hong Kong’s Chief Justice Geoffrey Ma Tao-li has also emphasized that the family system in Hong Kong must ensure that it is accessible, fair, efficient and provides a simpler modernized process for contested family and matrimonial cases. In May 2015 the Chief Justice’s Working Party accepted 136 proposals for procedural reform, including a single set of self-contained family justice procedural rules. More recently, in November 2016, Hong Kong’s Labour & Welfare Bureau in consultation with the Department of Justice, Home Affairs Bureau, Social Welfare Department (SWD), Judiciary and other relevant departments, prepared the long awaited draft “Children Proceedings (Parental Responsibility) Bill” (the Children’s Bill) for public consultation. The public consultation for the Children’s Bill highlights the serious implementation gap that exists between the extensive ideas for reforming Hong Kong’s child and family justice laws and actual implementation of that change. Many Hong Kong Law Reform Reports have recommended significant substantive and procedural change but until the announcement of the Children’s Bill in November 2016 very little legislative reform has been implemented. These reform reports highlight that vulnerable children and families dealing with separation and divorce are not merely encountering legal problems with social elements but, rather, these are profound social problems with one or more legal elements. In order to improve the experience of children and families in this context, a broader multidisciplinary system must be established rather than focusing primarily on the formal justice system. While some multistakeholder approaches have been established in Hong Kong, for example, the establishment of the Family Council in 2007 and the Comprehensive Child Development Service in West Kowloon in 2005, more formal collaborative inter-departmental measures need to be introduced in Hong Kong. 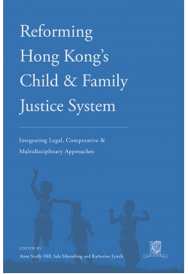 This chapter deals with the need to create formal systemic multi-disciplinary processes and structures with a broad approach to collaboration and consultation with Hong Kong’s child and family justice system and considers comparative approaches in the UK and Canada as possible reform models.